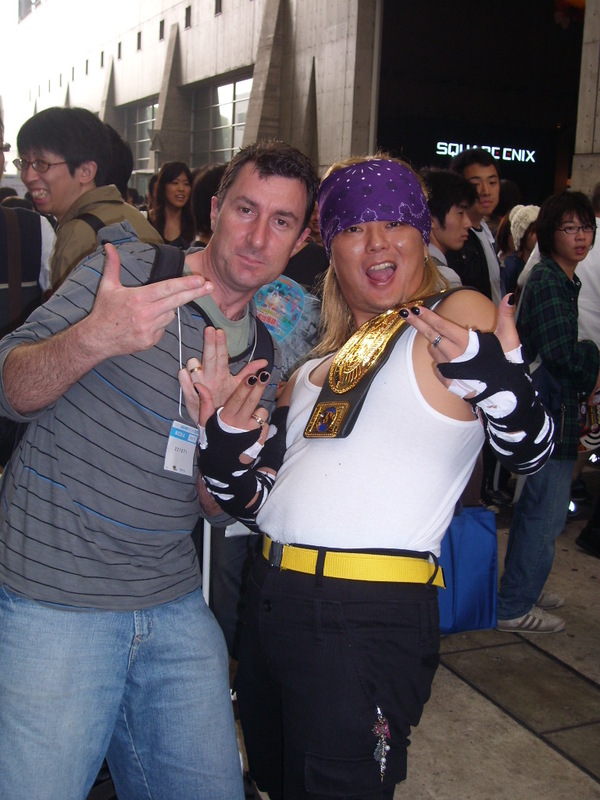 Just so there’s no confusion, that’s me on the left with a cosplayer from the 2008 Tokyo Game Show. This blog has evolved a bit over the past year or so. I used to think I could compete with big sites with big teams – I can’t. I don’t know why I actually thought I could. This blog is my passion: It’s a place where I can jot down my thoughts and review games and hardware. I”m also old, well probably old compared to a lot of game writers. How old? My first computer was a ZX Spectrum, a computer that you loaded games onto using a cassette player (the games came on cassette tape). I’ve been tempted many times to rename the blog Old Man Gamer. I write about things that interest me and I don’t tend to re-print press releases. There are plenty of other blogs around that will just regurgitate PR words and messaging. That’s their choice but that’s not me. I’m also not going to branch into music or movie reviews, like a lot of other sites I’ve seen do. This is a gaming and tech blog: It’s not a movie and music review site. The games I review on the site are generally copies or code that have been supplied by a publisher – I don’t tend to have the disposable income to buy too many games – but I’ll always say when the game has been provided by a third party. I’m very strong on transparency and disclosure. If a publisher has provided me the game, I’ll say that in the review. I’m lucky that companies like Nintendo, Xbox, Microsoft, Samsung, Huawei and PlayStation have faith in me and continue to provide product to review, despite the blog’s size. My writing has appeared in the The Press newspaper, Fairfax New Zealand’s nationwide website stuff.co.nz, the Sydney Morning Herald, Gamefreaks magazine, Game Console magazine, Hyper magazine (Australia), PC World (New Zealand), Tone magazine and gaming website Gameplanet. I also used to write a popular video-game centric blog Game Junkie on stuff.co.nz until Fairfax NZ decided it didn’t want to start paying me to write it when I took redundancy. I’ve attended E3 three times (2005, 2009, 2010), the Tokyo Game Show once (2008) and interviewed such gaming lumineries as Joseph Tung and and Frank O’Connor, from Bungie, Bruce Shelley, from Ensemble Studios, two guys from Sony Santa Monica (sorry, I’ve forgotten their names), guys from Guerilla Games, a guy from the Creative Assembly (I’ve forgotten his name, too) and Peter Molyneux, from Lionhead, twice. I also think I shared a cab in Los Angeles with Relic Entertainment co-founder Alex Garden either in 2005 or 2009. I’m not sure whether that was real or not but I think it was real. Anyway, I feel blessed to be writing about something that I love and plan to do it for as long as I can. So, thanks for calling by and visiting my site. I really, really appreciate it and I hope you like what you see. Drop me a line at gamejunkienz@gmail.com and say Hi. We also had a ZX Spectrum which used tapes. I learnt all the words to “Feed the World” through one of those tapes. Can’t remember what the game was but I did think it was pretty darn cool that you could load a game AND listen to a song at the same time. Hey – long time reader! When you were writing at Stuff did you feature a blog post about some software guys sent in that was like a little joke auto game junkie blog writer? I just had a flashback to something like that. I couldn’t anything when I went searching – do you have a link to that at all? Gabriel, hi. I remember the blog and the app you’re talking about. It was written by a fellow Game Junkie reader. Do you want to email me what you’re after at gamejunkienz@gmail.com? Or I can contact him directly for you and pass your email on? Let me know. Yeah, I remember that. It was from a software developer I know through Twitter. I don’t think there’s a link: It was just a program he wrote up for me. You are “New Zealand’s most respected video game writer”. I wish you were still writing on Stuff. No idea who Angus Deacon is, but his Far Cry 4 article is utter rubbish. Reads exactly like paid advertising. Thanks, mate. I wish I was still writing for Stuff – but it’s blog management refused to start paying me to write the blog after I left Fairfax last August. Thanks for reading.